Mar Sako denounces the new wave of violence that has hit "the towns of Nineveh." Many residents have fled and breathe a "renewed atmosphere of anxiety and fear". Kurdish President Barzani announces his retirement. And he charges Baghdad, Washington and internal opponents, guilty of treason. 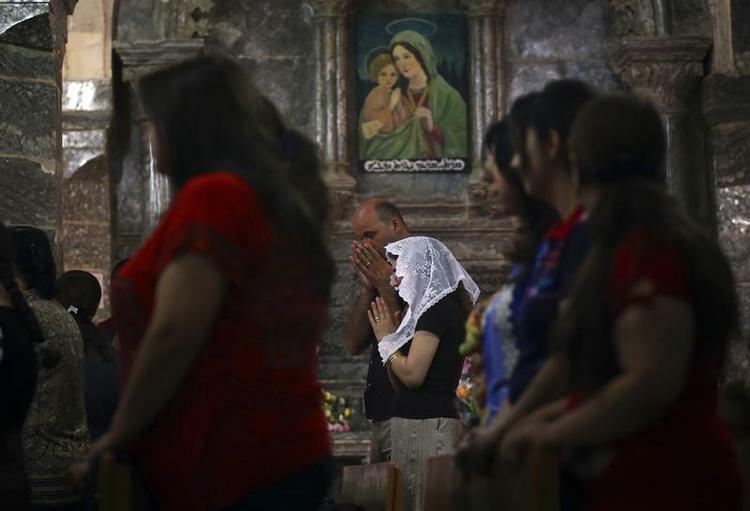 Baghdad (AsiaNews) - The referendum on the independence of Iraqi Kurdistan has triggered a new wave of violence investing the "Christian citizens of Nineveh plain." The result is that "many inhabitants" have "fled", creating a "renewed atmosphere of anxiety and fear", which will eventually "give rise to new divisions and prevent the reconstruction and return of people to their homes,” stresses the Chaldean primate Louis Raphael Sako, in an appeal published on the patriarchate website and sent to AsiaNews. In the letter, the leader of the Iraqi Church does not hide the danger that this further conflict, on a land already marked by suffering, may give rise to "further migration" of Christians. In a growing tension, the 71-year-old Kurdish leader Massoud Barzani announced his resignation as President of Kurdistan, shortly ahead of the expiration of the mandate scheduled for November 1st. He says he will not look for another term and launches a harsh accusation against the United States and a part of the Kurdish parliament. Barzani reproaches Washington for having already forgotten the Peshmerga's fundamental support in the fight against the Islamic State in Mosul and other areas of Iraq. He is the main promoter and builder of the referendum for independence, in response to which regular Iraqi troops launched an offensive in the territories - including Kirkuk - controlled by the Kurds. In an intervention broadcast on Kurdish TV, he said he wanted to continue "to be a Peshmerga in the ranks of the Kurdish people, who will always defend the victories of the Kurds." Barzani also accused the Baghdad government of violating the truce and the constitution by occupying Kirkuk with force. And he did not spare his criticism - but without explicit references – of the rivals of the Kurdistan Patriotic Union for the "betrayal" that led to the loss of Kirkuk (and its oil wells, an essential resource for Erbil). Invite the parties to dialogue "by analyzing the situation and trying to solve all outstanding issues with a renewed spirit of courage and full responsibility, looking to the good of the country" . Here is the letter of appeal from the Chaldean Patriarch sent to AsiaNews. Christians are not an outside part of Iraq, but they are in fact an indigenous people of the country. Their history, their identity, and their roots sink down over time back thousands of years. Today, despite their decline in numbers due to ethnic and religious violence, threats, seizures, killing, expropriation of land and shelling of their churches, in particular by the Islamic State (IS, formerly Isis) in Mosul and on the Nineveh plains, they seek to preserve their future with dignity and full equality with their Iraqi fellow citizens. Obviously, the displaced Christians of the Nineveh plain, who are trying to return to their native towns, are today experiencing a difficult situation. Seven months ago, Mosul and the plain of Nineveh were freed from the vice of the Islamic State, Isis. However, still today some Christian towns are still emptied of their original inhabitants because of the serious damage inflicted on homes and infrastructure. This is largely due to the inability of the central government to reconstruct it for lack of funds and because it did not want to give Christians the same importance as other priority situations. To date, those who have come back to their homes and where homes and infrastructures have been repaired, have done so thanks to the Church's efforts, albeit her modest resources. The other problem concerns the jurisdiction of the Nineveh plain, which was united, stable and secure until 2003; today, however, it is at the center of a dispute between the Iraqi government and the Kurdish forces. Since the referendum on the independence of Iraqi Kurdistan in September last, in which the desire for secession clearly emerged, there have been numerous military-style clashes between the Iraqi army and the popular mobilization militias ( Al-Hashd) on the one hand, and the Peshmerga Kurds on the other. These clashes happened at the borders of the Christian towns of Nineveh, and more recently in Baqofa and Teleskof. In these last episodes innocent children have been injured, and homes of Christian families have been used as defense positions. The result is that many residents of these towns have fled again, creating a renewed atmosphere of anxiety and fear of conflict between Baghdad and Erbil, which will eventually lead to new divisions and prevent reconstruction and return of people to their homes. All this will result in further migration abroad. In order to preserve the cultural and demographic diversity of Iraq, which has contributed historically to the renaissance and vitality of the country, we appeal to the Iraqi people to understand how important Christian presence in Iraq is, and what motivates them to emigrate. This would be a very serious loss for everyone in Iraq. 1. Remove the Nineveh plain from the battle zones so that it stays united as it was until 2003; the central government must resume control of most of its towns, so that residents can rebuild communities with their neighbors without further clashes. 2. Incorporate the "Guardians of the Nineveh Plain" and other militant groups within the federal police, under the leadership of a united national police force where local members of the Nineveh plain are relocated within the territory, to directly secure the plane's safety. Since they are locals, the locals will certainly have more confidence in them. 3. It is necessary to nurture efforts to maintain stability, security and build trust between all groups of people on the Nineveh plain. All of us must support the uprooting of a culture that rejects the diversity, hate and negation of the other. We must change this lack of support for reconstruction and, on the contrary, pave the way for the return of displaced persons to their homes. In all this, Nineveh's inhabitants should have full access to the state-provided services and assistance in the rehabilitation of their villages, cities, churches and schools, as is the case for the inhabitants of other regions. Finally, we turn to political parties and Christian organizations to fulfill their mission according to a principle of unity, trying to minimize differences in order to reach a common goal and open a new page in such difficult circumstances. And follow the example of the Chaldean patriarchate, which opens its heart to all, for the common good. On this occasion, we warmly appease to the Iraqi Government and the authorities of the Autonomous Region of Kurdistan (Krg), to sit at the dialogue table and to analyze the situation, trying to solve all outstanding issues with a renewed spirit of courage and full responsibility, looking for the good of the country. To do this, both sides must know that the Iraqi people and the Kurdish people, both suffering, refuse to continue the war.